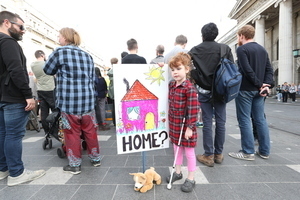 Take Back the City activists, who occupied a house at 34 North Frederick Street and were late this afternoon evicted (top) by a private security company with a large force of gardai in support, protest outside Store Street Garda Station, where six people were being detained after arrests for public order offences. The house at 34 North Frederick Street tonight. Posted in Misc and tagged Take Back The City at 12:41 am on September 12, 2018 by Bodger. Don’t be so hysterical, dearie. Get back to us when you see a water cannon and some tear gas. Don’t be such a contrarion dearie, hopefully next time they’re banging down your door and dragging your family away in cable ties..
pity the gardai are not along the quays in the morning. more drug dealing going on near the civic offices than I have ever seen before . Disgusting images. There will be riots on the streets to come if this continues. Gemma O Doherty is labelled a looney because she exposes this type of thing. This is orchestrated. It is done with purpose by the filth in Government who support these tactics. Where to begin with this. Absolutely shocking stuff. Time for a revolution. Proof that they were please? Proof they were vigilantes please. The thug face of a jackboot Fine Gael government – sickeningly propped up by Fianna Fail. Ireland 2018. Must have been some kickbacks going for the gardai to whore themselves out like that. I wonder which one of Poshboy’s and FG’s donors is the slumlord? Has Gemma O’Doherty investigated this for Village Magazine yet? Why does everyone get so upset when a blatant disregard for law and order, is met by law and order enforcement. Private property ownership has rights, like it or not. Unhappy about it? Go vote for socialist and anarchist candidates. Unhappy with your options? Stand for office. No-one voting for you? That’s democracy. I’d be glad to know that this option was available to me if I had militant squatters on my property. Thatcher once said there was no such thing as a society. She was wrong of course because each one of us engage with it everyday. Even just commuting from home to work requires adhering to a set of social rules. 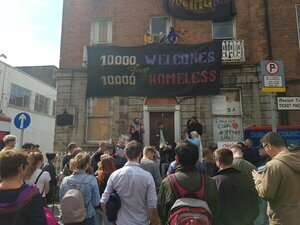 People hoarding property while others are homeless or dying on the streets have broken their social contact and if the government is not prepared to call this sharp practice to account then it is up to the people. The goal here is to raise the raise public awareness of this national emergency and direct action is the only way to do it. Then people can and will use their democratic mandate to ensure change. But the optics of this eviction are terrible. If these people are so proud of what they are doing then why did they need to hide their faces? It is an absolute own goal. I agree with SOQ. This is how people communicate to politicians and the wider society. 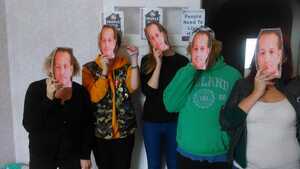 The same way the ‘housing activists’ all wore Leo masks? Great to see some proper law and order being enforced. Unfortunately one form of vigilantism will inevitably lead to another. These are privately owned properties and the owner is under no obligation to assist in solving a homeless crisis. If you want the owner to do something you need to change the incentives. Make it more penal to hoard property and maybe, just maybe, make it more worth their while to rent it. Make it worth their while? Because Dublin rents are so low, right? Dr_chimp is correct. These ‘protests’ are a form of vigilantism. And not the ‘legitimate’ type whereby the police aren’t doing their job so the people take the law into their own hands – no, it’s where a group of people have decided to take the law into their own hands. There is a word for this: criminal. Bullpoo. If the NRA gets permission to build a new road they can place a compulsory purchase order on any property inside a swept path of that road. Private property rights come second to social need and this is no different. I used the term sharp practice because that is what property hoarding is. These are empty buildings being left to rot while people are dying in doorways. Unjustifiable in any civilised society. I don’t think anyone thinks people dying in doorways is ever justifiable. But it does happen, no matter how rich or poor a society is. And there’s no question that that would be the absolute worst effort at a solution, whereas an overhaul of planning laws and taxation to incetivise development and penalise dereliction should be such a no-brainer you have to assume avoiding such measures is a deliberate policy. @ chimp. Why are these buildings being left to fall down? You can bet that for the most part it is monetary gain. For various reasons compulsory orders on property already happen so why would this be any different? I think that a use it or lose policy would have widespread support myself. @ Nigel, I don’t think it’s deliberate policy to keep people homeless and drive up rents/prices for the rest. Why do it? 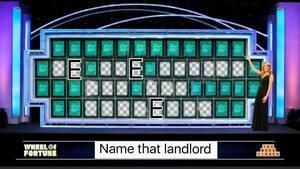 It can’t be just about being in the pockets of banks and landlords. @ SOQ, I’ve no doubt that monetary gain plays its part. But at the same time, making monetary gain is not a crime. You can more or less do whatever you want with your property. I agree with your sentiment that a ‘use it or lose it’ policy would have support. I would support it. But I would support it via a disincentive like a tax rather than an outright “we’re just taking your house because we don’t think you’re making the best social use out of it”. However, all you have to do is look at the vacant site levy to see that the state is totally incompetent and under resourced to implement it properly. Do we even know how many vacant properties there are in Dublin? Dr.Chimp .. you say “if you want to do something you need to change the incentives” .. so how do regular citizens do that? It’s politicians who have the power to do that. They have not done it, and show no signs of implementing such policies. So you do the only thing you can do, you make some noise about it. What these people are doing, is just that. They have not damaged the property, or hurt anyone, police have arrived and moved them on. But they’ve done a lot in making this issue more talked about. So why do you, and many others on here, speak negtively of their actions? Dr.Fart…you’re right, the government has not done enough and there are many reasons for that, one of which is the over bureaucratic and underfunded mess that is our planning and development system. It is an absolute joke. I fully understand the ‘why’ these people are angry and protesting. But I don’t agree with the method…the mob has arbitrarily decided which properties should be confiscated from private ownership. What if they think that you are being wasteful with your property and that you should be able to fit at least 3 more people in there? what’s to stop them taking over your house until you agree? You might think the occupations are simply raising awareness but just look at their list of demands…its soviet style collectivisation. That can’t be the answer to this problem. I agree with SOQ, but i also agree with Ronan. Get reefed out of your illegal property occupation. Yes. Stop whining about being reefed out, and keep protesting. The faux shock over being pulled out of an illegal peoperty occupation is laughable. What did they think was going to happen…? to be asked nicely… its a protest ffs, not a toddlers sit in. The optics are as stark as they are atrocious. They’d be fairly poor protestors if they didn’t capitalise on it to highlight the priorities of the government. I wouldn’t want to be the target of a populist mob, actual or online, just for doing my job, but the anger at the skewed priorities is real and justified. No, but you’d happily be part of the mob. You are a strong supporter of antifa, so please, put a sock in the idea of not being a mob supporter, you most definitely are and have argued that you are on numerous occasions on here. You faux concern over the tactics of mobs is bloody hilarious! Links to my multiple clear, unambiguous and forthright defenses of and expressions of support for antifa, please. Or apologise. Or LOL away home. p*** off with your denial and insistence that I go find the comments. You know you have vociferously defended antifa and their violent approach to protest. I shudder to think what deformed and monstrous version of me exists in your head. The upside is that the more horrific it gets, the more gorgeous I become, like a digital Dorian Gray! No monster, just an ignorant dishonest Smugglypuff character. b) The Smugglypuffs won the Hogwarts House Cup three years running so feck you, Slytherin-face. a) is that accusation the same one when you on a number of occasions ran up and down a thread calling me a liar when you denied calling others Nazis, altrighters and fascists? Remember that, do u remember when i showed you the evidence of your lieng then, eh :) You’re losing again now. Just got 3% more gorgeous. I remember, though judging by your description you do not. I usually apologise when I make a mistake. Now you should too. I have never expressed support for antifa. You are lying. In your defence you are not very bright and tend to reject nuance and complexity for simple-minded belligerence, but in this you are lying. I do. I apologized yesterday. Next accusation please,refuting is fun. I’ll be at a desktop later, if I’ve the time I’ll show you your pro violent t protest support and evidence of your lieng, if you wish, hypocrite. Loving your adhom at the end there, you must be desperate, knowing the truth will out you as a total liar. How can you have apologised yesterday for something you did today? Are you invoking time travel? Looking forward to it! I expect lots of over-broad interpretation, wildly mistaken inferences, selective deafness to sarcasm and humour, thuddingly stupid reading incomprehension and outright bare-faced lying! I might have a bingo card done up. And, dude, you’ve called me a deluded fool so often I don’t even notice any more, it sinks into the rest of the inane performative noise of your LOLs and headdesks. All of this entire exchange is you embarking on an ad hom. I bet readers of this torrid conversation think that I am deliberately trolling you, but this is just how you deal with disagreement. I’m sure you’ll find no overboard interpretation on the nazi slur, as the comment linked confirms you are specifically clarifying that that is “actually” what you meant – to call me a Nazi, alt right, fascist, mysoginist etc. Funny thing is, in my search, there were a number of other commenters who also understood you to be calling myself and others those things. Don’t cry wolf… or accuse others of being a liar, like that, if you want to be believed in future. Then there’s the times you defended antifa, example here – https://www.broadsheet.ie/2017/08/29/de-wednesday-papers-228/#comment-1861189 – saying that they were framed as bogeymen. This is the point where I give you an apology. I see that ‘defending’ isn’t ‘supporting’ and that the meaning of words is important, as I’ve said many many times before. Thusly, I’ll take back my accusation that you lied about supporting antifa; you only have record for defending them on occasion, which is fine, as I too would, as an example, defend their right to speak (only speak, not their violence). It was your past form for lying was the reason I made the jump to the conclusion you were again lying, and for that I do apologise, and am sorry for that, Nigel. Clampers the comment is right there for God’s sake I did NOT say you never apologise I said you should apologise now, on this occasion, ie, to me. Nearly every other instance you cite has a similarly sloppy misreading too tedious to tease out. If you think being of the opinion that antifa are being inflated as a right wing bogeyperson is a defence of antifa as opposed to a critque of the right, fine I won’t argue the point. I assume your reference to me lying in the past has similar characteristics. My comment above holds true for your approach to this. Never called you a Nazi though. Apology accepted. Someone slap me in the face with a wet kipper if I ever reply to you again. You’re a typical Lefty Nigel…. demands a standard of others that you are not willing to give yourself. So predictable…. I wish you’d prove me wrong, but I doubt it, as double standards appear to be bread and butter to you, me thinks…. pffft! You said I espouse an alt right misogynist racist nazi fascist lifestyle. You got them all into one sentence too. You do know what ‘espouse’ means? If that is not calling someone a Nazi etc. then you truly have gone full postmodernist in your use of language and the warping of the meaning of words. adopt or support (a cause, belief, or way of life). 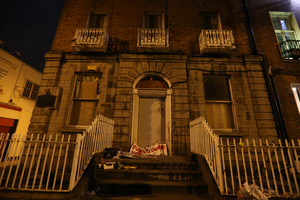 We’re told there’s a housing shortage and that’s why people are sleeping in doorways and garda stations, yet here’s a building that’s lain empty for three years. Did you know there are buildings in the middle of an area deprived of proper housing that are lying empty? Well you do now because of the awareness raised by these protesters. I’m sure there are plenty of building lying empty everywhere. What I would really like to know is what percentage of them are like this one, which ones are permantly Air B’B’d and which ones are empty because of the fair deal scheme. The issue is not law and order enforcement. Masked goons, supported by the masked PO unit, evicting squatters during a housing crisis is a little more than simple law enforcement. Why were the private security firm masked and in an unmarked van? Why were the PO unit there instead of a couple of uniforms with the PO unit on standby? I’m in favour of the Gardai doing their job in this instance, but I don’t like that they’re wearing masks. I don’t think that’s the right thing to do. Obviously I understand that they and their families are being identified and threatened by nutjobs, but I don’t think that the wearing of masks is the right way to deal with it. Do you an alternative solution? What other way could they possibly do it, save for wearing masks? If you illegally occupy a building in violation of a court order, it is possibility that you will encounter men wearing masks; if you don’t want that to happen, vacate the building once the court order is delivered. Questioning the methods used by the gardaí is not outrage. Starting the operation with the PO unit was a misstep and the optics won’t please a government obsessed with image. 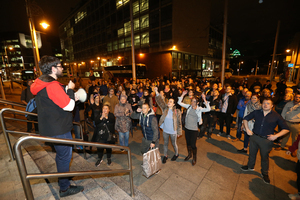 The workings of the judiciary are independent of the govt anyway; I don’t know how people can blame the govt for a judge issuing a court order in accordance with the law, bailiffs legally carrying out the order, and Gardaí attending the scene for operational reasons – it’s not as if Leo rings up Garda HQ in such instances and tells them how many Gardaí should be sent, and what they should wear. The only people that will be upset by the optics of this are likely people that weren’t too keen on the government in the first place. There is a official separation between the judiciary and the government but let’s be realistic. Do you honestly believe the new Garda commissioner won’t be getting a phone call from government this morning about masked men evicting people while the government struggles to deal with a housing crisis? Do you think that he should? I hope the inspector in charge of Store St or wherever is permitted to operate with enough autonomy that he can decide the appropriate number of Gardaí to assign to a situation to keep everyone safe, without interference from politicians concerned about optics. And I hope that Leo et al have better things to be doing (namely, the housing crisis) than interfering with the day-to-day operations of the Gardaí on the basis of some manufactured outrage. …tús maith, leath na hoibre…eh, Drew Harris…some of your old mates from the UDA getting gainful employment? That’s a libellous, baseless comment. Very cheap. meanwhile what have they achieved? I’m not being facetious. The homelessness crisis needs an overhaul of planning laws and local councils and funding priorities and taxation, and it needs to have started ten years ago, but there’s no sign of it starting at all. The point of this protest isn’t to ‘fix-up’ a place but to show how utterly non-existent meaningful government action has been and continues to be by reminding the public that vacant sites and properties are everywhere and the laws are designed to keep them that way. Awh I used to love Challenge Anneka in her big blue truck with her little car that rolled out of the back! Good times!! mm, it wasn’t her big blue truck i was looking at. This from a lad who wears a plastic bag on his head to hide his identity. Nothing scarier than a comedian with a spar bag on his face, eh? So it is ok, celebrated even, when the protesters conceal their identities. However, when law enforcement do it we are outraged? Oh look, it was published. Conspiracy theorists are the funniest ! In the history of the state no Taoiseach has ever been directly elected to that role by the people. Shame on you for not knowing how our government works. Finally, coming on here and saying “this won’t be published as criticism of Leo is filtered”….. you don’t come here often do you? There are plenty of smart muppets, as well you know. It’s cute that you think you’d pass it. The outrage over this is depressing. The gardai are there to ensure a court ordered eviction is carried out. The court applied the law and the gardai have a duty to follow that. If these lads feel that’s unjust then take it to a court. The reason they are wearing balaclavas is to protect their identity. There are countless Facebook groups setup where faces are uploaded and home addresses sought. These are normal, decent guys doing a job for not much money. They don’t deserve that and fup anyone who screams police state when they are protecting themselves. Isn’t it illegal for gardaí to protect their identity, though? Shoulder numbers are to be worn at all times. This is in no way a proportionate response. if you look at the photo above you can see badge numbers are visible on some of the Garda. The other may also have ID but just not in those photos. So they can be identified. My, but there has been a sudden resurrection of FG bots. All waiting for the off. Election on the way. Can’t wait. “How dare they wear masks!” said the people who wore masks. 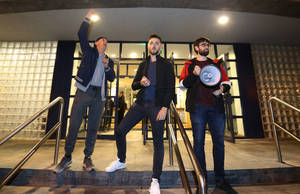 If the eviction had taken place with a light, unmasked Garda presence it would have probably garnered little to no attention, so frankly, they deserve the backlash for coming the heavy like this. I think people prefer it when the Guards de-escalate and engage rather than stand around looking like a covert paramilitary force. In what world exactly would this “have probably garnered little to no attention”. The entire point of the protest was to ‘raise awareness’. The organisers WANTED this to get more attention. If they wanted to little to no attention, they would have left when ordered to by a court. Baliffs legally entered the premises and legally evicted people. I’m going to guess that whatever heavy handed tactics occured was in no way one way traffic. That’s exactly why the guards were there. You said yourself, attention had wandered off these protests – they’ve almost become commonplace. I’m sure if there was a less thuggish-looking police-state-evoking ejection they would have tried to garner attention, but there’s no way it would have exploded the way this did. Apart from the illegality of the occupation, the protestors have not been physically and verbally threatening or abusive the way the water protestors (arguably) were, or if they were it hasn’t come out. The justification for dressing up like this seems both thin and self-defeating. An eviction was inevitable, would have been met with a shrug and onto the next occupation. This blew it up. Would have been met with a shrug? Not likely. However I do agree with the self defeating part, however If i was in the lads shoes, I’d probably do the same thing. They don’t give a toss about how this blew up* and now they don’t have to be subjected to morons calling them out in public and on twitter as scum. *Blew up is a relative term here. I mean it might have still blown up, on a slow news day, of which there aren’t that many at the moment, I just think this made the blow-up inevitable. Enforcing an eviction order is not an option for the Courts Service, so you can knit that into all sorts of shapes and sizes to suit your view on what went on here. I could go on about how I deal with Enforcement Orders but it is of no assistance here as I strictly deal with Family Home cases. But I felt the need to comment before the matter gets washed away in the next news cycle. The wearing of Balaclavas is a development that is just too sinister, and I don’t believe the HC Judge that signed the orders would agree with them either. If I am wrong, then I am wrong. 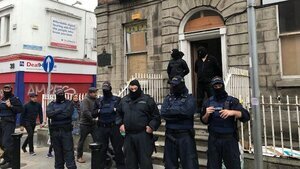 However I cannot stand by and watch a method of securing a property on foot of a legal order by an Irish Judge, sitting in an Irish Court, whatever the jurisdiction, that gives permission to bring Black Balaclavas back onto our streets. So I wanted to say something about it. Surely the guys doing the evicting are not acting on behalf of the state or the judiciary so can wear anything they please be it a clown costume or a balaclava? Don’t you think it’s just a little bit ironic to whinge about the optics of a situation when the entire situation came about and was stage managed entirely to create optics? You’re demonstrating moronic behavior- your own – by purporting to be a know it all internet commenter but not understanding basic meanings of words. Nice strawman Moyest, don’t ever change. It’s a bit rich to act shocked or cynical about the reasonably obvious fact that public political protests involve the creation of situations and optics to garner public attention. Somehow I doubt the protestors stage-managed the Guards into wearing the balaclavas, though. Really? You think that’s Moyest? Moyest would have been more angry-in-support-of-the-protestors-decrying-the-fascists, surely? I thought this was that other one who mostly spent their time attacking other commenters, the one who said that horrible thing about Dara Quigley that time. Freedom isn’t on here long, and a big gap between Freedom appearing and Moyest’s disappearance…. you could be right! “Fupp landlords” pretty much sums up the level of nuance coming from the populist/permanently outraged crowd. 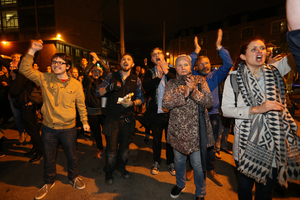 All landlords bad, all protesters good, makes for a very simple life for the simple folk. Of course if squatters took over their house or their parents’ houses most of these people would be straight on the phone crying to the ‘pigs’. It doesn’t matter what happened inside, they could have all had a cup of tea and said a decade of the rosary for all we know but arriving like they were on a knee capping job played right into hands of the protesters. Guards need to learn quickly that these are political actions from people who know their rights. Approach them civilly and the response will be likewise. The beef is not with the guards or even the bailiffs because they are just ordinary working men and women too. They ignored all the requests to leave, and the court order to leave. Well my, my. That sounds like civil disobedience to me, Cian. See what he was responding to, he even provided a quote for your perusal. You’re as old and just as cynical as myself. Just ask yourself one question. Cui bono? Authorisation for this operation must have come from a reasonably senior rank within AGS. Now why would that happen, hmm? What possible motivation would anyone within that august and respected body have to cause such an embarassing and controversial scene? A new commissioner from up d’north foisted on AGS by FG? Embarassment for their new leader (and Our Glorious Leader, blessed be his name)? I wonder if Jackdaw has any insight to contribute?